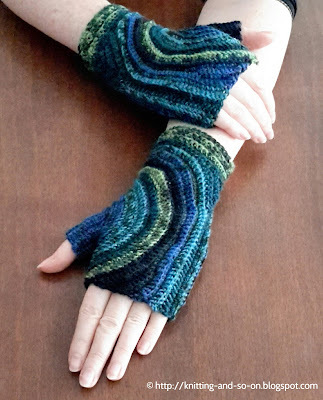 Keep your hands warm this winter with these stylish and unique fingerless gloves. 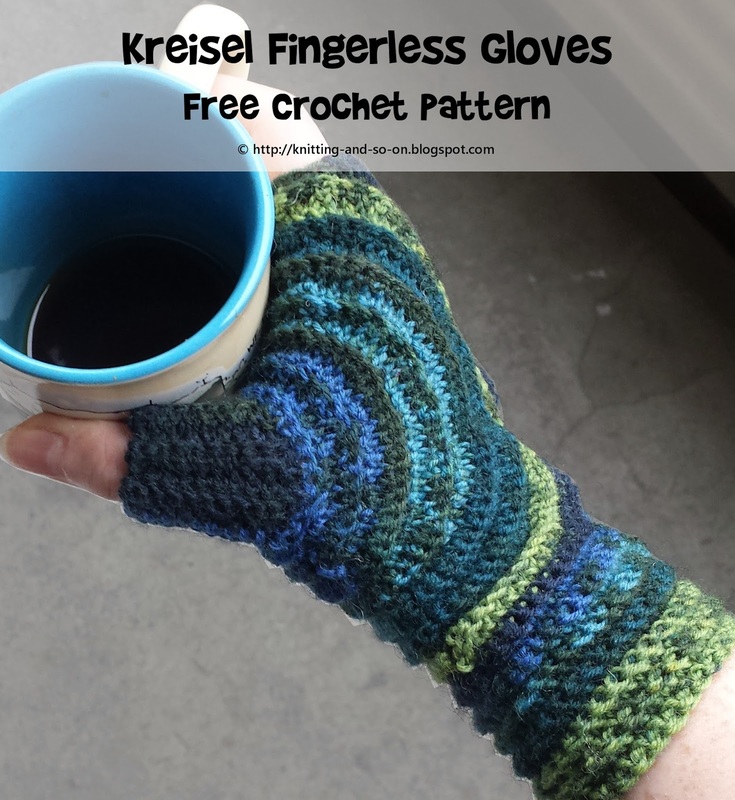 They are crocheted around the thumb which allows you to show off your variegated yarn to the best effect. 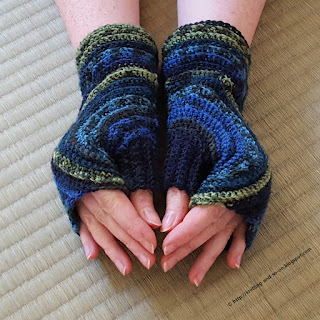 These mitts are the crochet version of my knitted Circle Mitts. Kreisel is the german word for (spinning) top. [y]*x: work the sequence y (within the brackets) x times. crochet short rows (as done in this pattern (*)): work sc's (or sctbl's) up to the stitch indicated, then turn work (without a turning-chain) and start into the 2nd sc; when you're working over this turn in a following row, always crochet into the turning-sc as well. (*) there may be different methods out there, feel free to try them. When crocheting in the round, the structure of the finished piece looks different than when crocheting back and forth. Since in the original (knitted) Circle Mitts are knitted in the round (parts 1 and 2), back and forth (part 3) and then in the round again (part 4), I needed to change the pattern in a way that a change like that wouldn't occur - at least for parts 2 to 4. Therefore, these mitts are constructed as follows: it starts with the thumb (part 1) which is finished by connecting the edges and creating a small tube (the thumb). 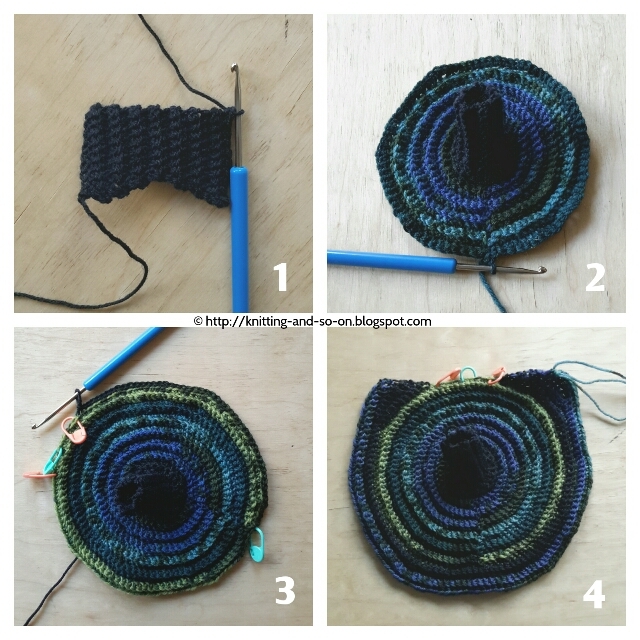 Part 2 starts with crocheting around one edge of this tube and increases in circles. However after each "round" direction is changed (i.e. the round closed by a slip stitch and the piece is turned). Start with a ring of 5 chains or a magic ring. Into this ring do a set-up row consisting 8 single crochets, close round with slip stitch. For this pattern the above recipe will be applied. As with many of my patterns, it is written in a way that you can adjust it to your hand size. If you're uncomfortable with instructions like that, the pattern might not be for you. Now your piece should look like in picture 1. Fold the edges together (chain edge and your last row) and connect. Setup Round: Chain 1, and stitch about 20 sc's into the rim of the thumb in the round (while you're doing this you're looking to the inside of the thumb), after about 20 stitches you should be back at the beginning. close with a slip stitch. Chain 1 and turn. For the next rounds, do the circle crochet recipe from above, but crochet sctbl stitches. Don't forget to change crochet direction (ie. turn) after every round. If you had to crochet a few rounds more during part 1, there may be more stitches. If you have between less than or excatly 24 stitches in the round, you the next round should be increasing every 3rd stitch. If you made the thumb bigger and have more than 25 stitches start with increasing every 4th stitch. After a few rounds your piece should look as like picture 2. Continue until the distance between the thumb and the upper edge is high enough for you. Make sure to end on an outside row. For me this was the case after 13 rows. When the distance between the thumb and the upper edge is high enough, move to part 3. Don't do a chain and don't turn after the last round. Count your stitches, place stitchmarkers at the beginning of the round, the middle of the round, and around 5 stitches before the middle marker and 5 stitches after the mittle marker. These last two markers mark the ends of the rows in part 3. Don't turn but go on crocheting in the same direction, but now with slip stitches into the back loop until you have reached the marker that is placed 5 stitches before the middle marker. The point of these slip stitches and the subsequent stitches into the stitch below, is to get an even texture on the outside - the slip stitches will be hidden behind the next row. Your piece should now look as in picture 3. Row 2: dec, sctbl 9, turn, sctbl to last 2 stitches, dec; chain 1 and turn; dec, sctbl to last 2 stitches (while doing the circle increases) to the last 2 stitches, dec - this row with a short row is needed to widen the upper edge - your piece should now look similar to picture 4. Repeat Row 4 until the the piece fits around your hand (or until the upper edge equals the hand circumference at the knuckles and the widest part equals the hand circumference at the base of the thumb) - see picture 5. If you want to widen the upper edge more, you can do one or more repeats of row 2 (i.e. using short rows). After you have finished, count your stitches again. Devide the number of stitches by 4 and add 2 or 3. This is the number of stitches that you're going to connect to the other side of the mitt. I had 99 stitches - devided by 4 makes a bit less than 25, plus 2 makes 27. Hold the right sides of the mitt together and connect the number of stitches that you just calculated. Your piece should now look like in picture 6. Turn the mitt back right sides out (be sure to secure your last loop while you're doing this) and put a stitch marker in the current stitch. (You can remove all other stitch markers at this point). For an even texture you need again to hide the next few slip stitches before continuing. 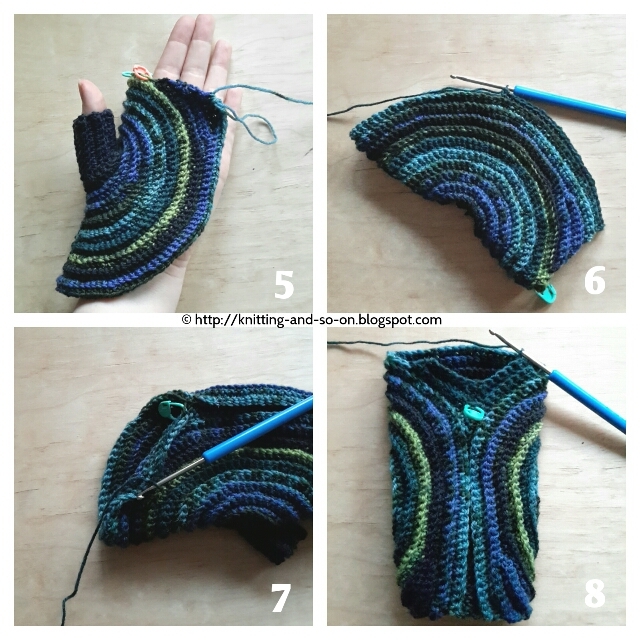 If the last row you knitted in part 3 was an even numbered-row, you need to do slip stitches up the right hand side as seen from the current stitch, if it was an even numbered row, you need need to do the following slip stitches towards the left. In my case, I had crocheted 7 rows in part 3, so I did my slip stitches up the left side (see picture 7). Now you can start to work on the little triangle on top of the joined stitches as follows (see picture 8). These are short rows, so you don't crochet a turning-chain but start with the second stitch. Now do several more rounds of sctbl's until the shaft of the mitt is as long as you want it, i.e. Make sure to end each round with a slip stitch, chain 1 and turn - to keep up the regular stitch pattern. 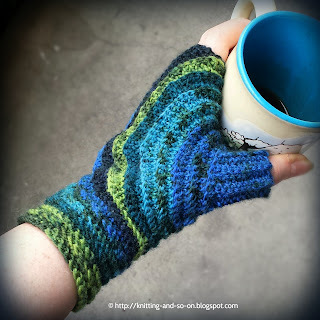 Try your mitts on for size (or measure the circumference, it should equal your wrist circumference). If the shaft is too wide you can do some decreasing rounds as well, i.e. This pattern was featured as most clicked at the Hookin on Hump Day Link Party 107. 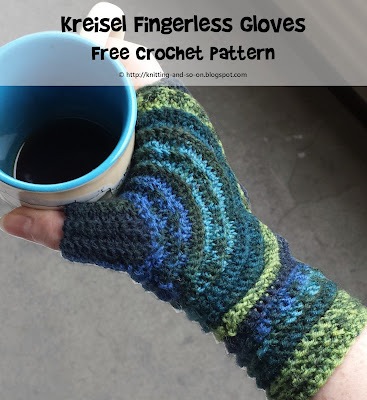 It was also featured in the Stash-buster Link Party on Linda's Crafty Corner in December 2015, on the Crafting Along Link Party #120 at Be a Crafter and at Yarn Fanstastic Party #54 at EyeLoveKnots. Super look!!! Theses are wonderful! Thank you so much for the pattern and tutorial!! Dit lyk baie oulik! Baie dankie vir die patroon! Gorgeous pattern!!! 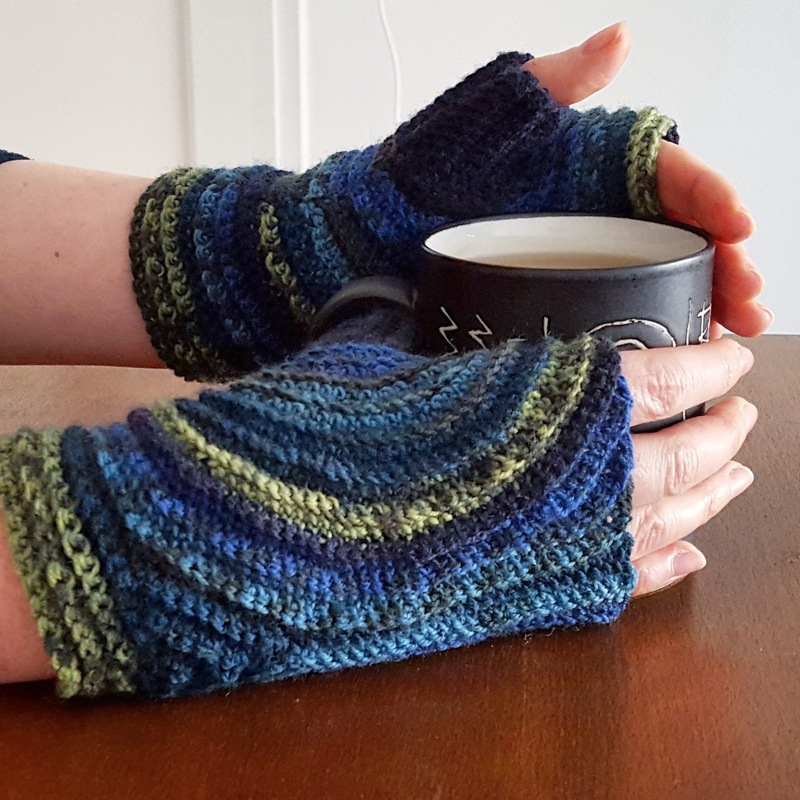 Ive made several varieties if fingerless mitts but these are so unique and special!!!! love the circle design - makes these fingerless gloves very unique! beautiful yarn, beautiful gloves! Thank you. The yarn is a inexpensive sock yarn that I bought at a discounter (Aldi in Germany) called Vendita Sockenwolle. The colours are fab and I just love the design but even more I love that they have a thumb! I guess I got lucky that the colors from that yarn (from Aldi as a winter special) mixed up so well. I'm so hoping that there is a video tutorial for this??? I'm having a hard time following this pattern. These are beautiful. 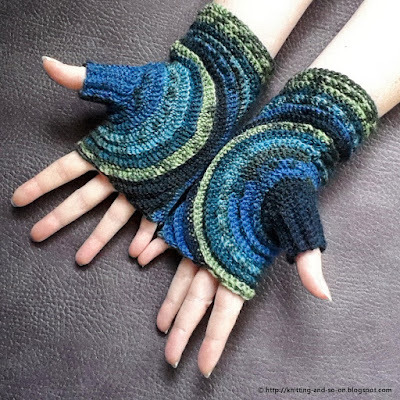 Is there a worsted weight yarn pattern for them? Well, not as such. But most of the instructions tell you to continue "until it's wide enough to fit your hands" (or similar). So it should be easily adapatable to other yarn weights. I'm having difficulty too, immediately. Rows 3-7 don't make sense to me. Please explain? The decreases and increases aren't clear. I'm sorry I don't have the equipment for making a video. I'm stuck on Part 3 Row 2. After you do the short rows, do you crochet down the side of the short rows to continue around the wrist end of the "circle", then do short rows in the other side? How do you place those stitches to keep a consistent texture, or does it not show? 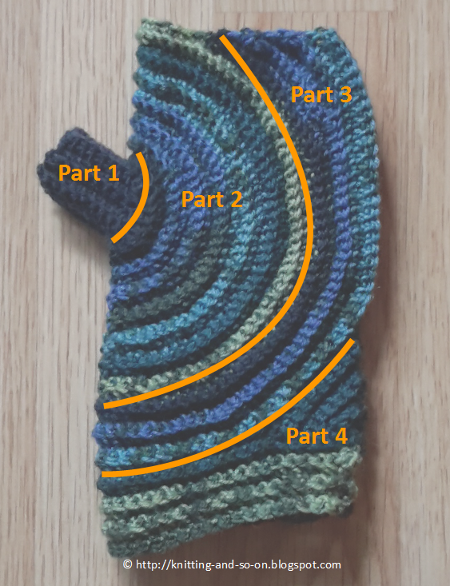 Can you post pictures of that part of the pattern in progress? I'm so excited to finish this project! After you've crocheted full rows (but back and forth - in part 2), you need to crochet back and forth in the next part, too. That's why the pattern asks you to crochet the "hidden stitches" (slip stitches on the back side) to get to the new starting point of the rows (before row 1 of part 3). Then you start crocheting back and forth, but this time not quite around the circle - only up to the stitch marker (row 1 and following of part 3). To widen the upper edge you insert short row sequences - and they fit perfectly into the back-and-forth texture that's already there. After row 2 of part 3 your piece should look like picture 4. I hope this helps. The photos that I've taken are already in this post. And I don't have other ones. Thanks for responding! I don't think I was being really clear, sorry. I'm up to that point, then where to I put the dec? In the side of the stitches of the short row, or in the top of the sc way down below that continues the circle (which makes a weird little bump)? And do I start my increase count for the circle at the end of the last short row, or at the start of it? Thank you for doing this not just in a knit pattern, but in crochet also. It was a little beyond my abilities but I did finish a pair in crochet. I will try u-turn ones next. Very artistic patterns! Thank you. Hope you had fun crocheting! super, sehen toll aus. Gibt es da auch eine deutsche Anleitung dazu? vielen Dank! Danke dir! Derzeit ist mir keine deutsche Übersetzung dazu bekannt. 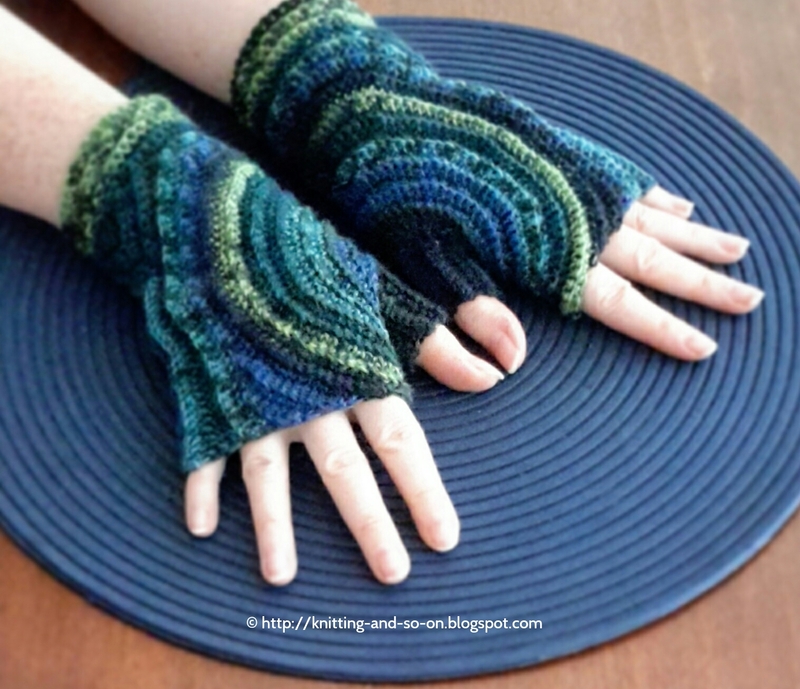 Die Liste aller Übersetzungen meiner Anleitungen findest du hier: https://knitting-and-so-on.blogspot.de/2017/01/translations-of-my-patterns.html (dabei sind auch einige auf Deutsch). Thank you ♥ Happy crocheting!